Hey, I got a new little friend to add to my never-ending felted holiday decor. I’ve had this idea ever since I scored a bunch of embroidery hoops at the thrift store. The little hat and scarf were cut from another felted sweater, but polar fleece would also work in this situation. The buttons are miscellaneous ones from my button jar and the nose is a felt ball. He is very lightweight and hangs easily on a hook or nail. I apologize for the off-the cuff tutorial, but I’m trying to be economical with my time. This was supposed to be a project for a 2009 holiday magazine, but they want something else. So, I get to share it with you instead! Problem is, I still have the magazine project on my to-do list. D’oh! If you try one and need some help, give me a holler. 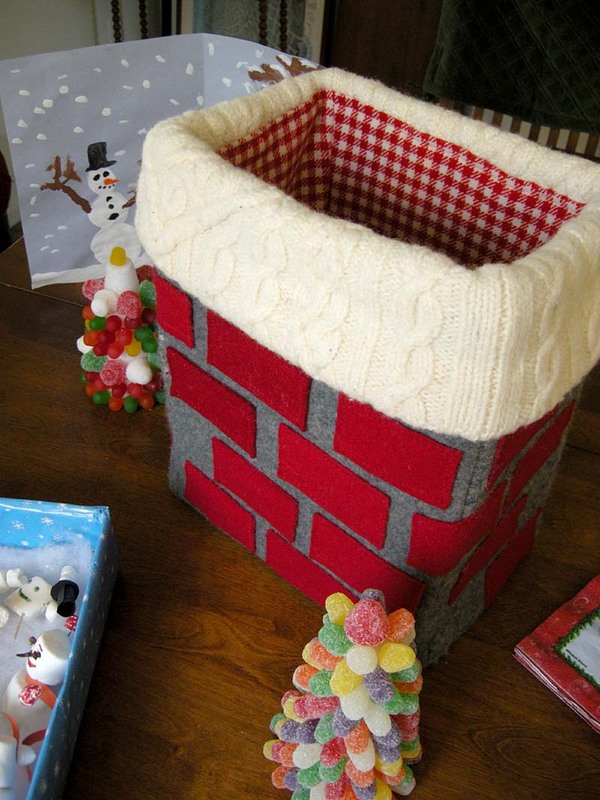 Oh, and here’s one more felty holiday tradition we have. I showed our “jack horner pie” last year but just had to post it again. 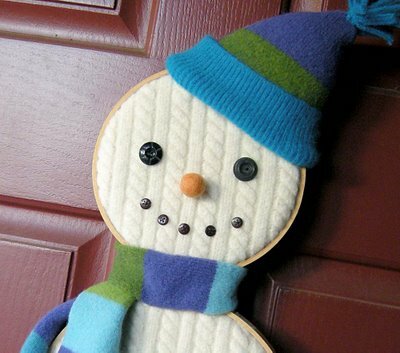 Besides, it’s a good use for any leftover fisherman sweater you might have if you make the snowman. Ok, now back to my To Do list…have a good Wednesday! This work by Betz White is licensed under a Creative Commons Attribution-Noncommercial-No Derivative Works 3.0 United States License. Love it!! My whole house is covered in snowmen this holiday season. 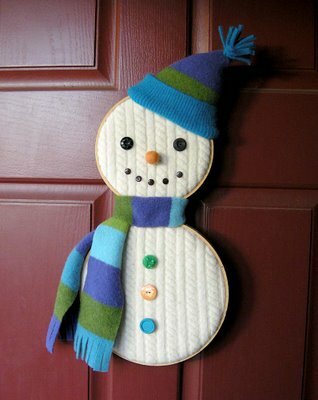 I love snowmen and that crafty idea is great! Love it and it is so easy! Thank you!!! You are so innovative. I wish I had lots of creative ideas like you do! He just makes me smile…he looks so happy to be alive, hehe! Very creative, I always love your ideas! I’d love to get to make one of these (now let’s see if I can get all of my other decorations finished first). Ooo, baby cryin’ ….good day to you! Wow – you are so talented. The snowman is super cute, my children would adore him. way tooo cute! you are my hero! That is sooooooooooo incredibly adorable! I absolutely love snowmen, crafting and eco-friendly projects and this fits the bill entirely! Keep it up, I always love checking in with your new projects and ideas :-). I love it! A great project for the several felted fisherman’s sweaters that are too bulky to do anything else with. I will make this for sure. Thanks for the great idea. I am really liking that chimney and thinking it would be a good thing to hold some Christmas cards…which reminds me I need to get mine into the mail. This season really does go by quickly doesn’t it. Great projects here. Thanks for sharing. I love how you always take something and turn it into something completely unexpected, the snowman is so cute! The snowman is adorable! This is the perfect gift to make for my kids teachers this year. That snowman is ridiculously adorable!!! Ridiculous! I’ll say it again! Adorable! Love the little guy!~What a clever use of recycled sweater’s and embroidery hoops. I’m already starting to get things together for next holiday …this will definetly be something I add to my to do list. Good luck with the magazine article! wow fantastic snowman! great idea i’ve got a few hoops lying idle here somewhere! Your snowman is adorable (no surprise), but I just had to comment about your Jack Horner Pie/Chimney tradition. My family has had that same tradition for at least 80 years. My great grandmother (Grandma Clio – “great grandma” made her feel old) wrapped small gifts for everyone, with strings leading to each person’s place at the table. As the family grew, the strings disappeared and were replaced with clues in the form of short rhymes on the outside of the gifts. We have to read our rhymes out loud and try to guess the contents of the gift based on the rhyme. Although Grandma Clio is no longer with us, my grandfather continued the tradition, and now that he is gone, my grandmother chooses the gifts and writes the rhymes each year. thanks piecemealquilts for sharing that story! Love it! Very clever snowman idea, he’s absolutely adorable!! Oh a penguin sounds great! Especially if you use a long oval hoop vertically. :) Send pics if you make one! Could that BE any cuter? I think not! I made 8 of these to give as gifts to teachers and for a few neighbors. They turned out way too cute. I used felt instead of wool because i could not get my hands on any wool quickly. What a great tutorial! I love this snowman idea. I’m also delighted to see the return of the chimney. Just adorable! And SO clever! This is SO cozy and fabulous, I just love it!!! How clever! And oh so sweatery cute! I thought the gingerbread and snowman were just the cutest things around! I have a knitting business blog. If you want to take a look at it, please do! The address for it is: knittingbyleah.blogspot.com. If you see anything that you’d like me to make for the winter season, just let me know and you can send an e-mail to me at [email protected]. Thank you so much for sharing your art! That is super cute – thanks for sharing! he is so cute! I love this idea! This will be the perfect cutie for my front door. I’m going to make one tomorrow (well maybe the next day). oh!!! LOVELY. Congratulatios for this blog.